Post-war car production in both East and West Germany recommenced with pre-war designs. 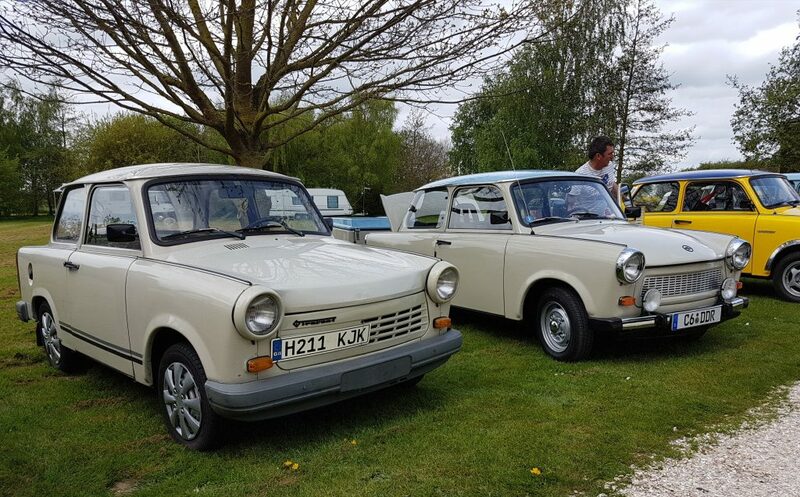 Following political separation of the two Germanys, the communist German Democratic Republic (DDR) eventually standardised car production on the Trabant and Wartburg models. The familiar P601 is the most common of several Trabant developments dating back to the production of the first few P50s in 1957. The cars were made in the former Horch factory in Zwickau by VEB Sachsenring which was part of the East German IFA group of vehicle manufacturing companies. Production of the P601 started in 1964 with a few pre-production cars being made a year earlier. The P601 was a relatively advanced car when launched featuring front wheel drive, a transverse engine, monocoque construction, composite bodywork and independent suspension all around. The engine was a new, air cooled, twin cylinder two stroke with inlet via rotary disc valves in the crankcase. This was world-leading racing motorbike technology at the time when the engine was first developed. Although the body shape of the P601 remained basically unaltered, cars were continuously developed with every year bringing a number of changes and upgrades. Cleverly, many of the changes were made in such a way that newer parts could be fitted to older cars. During the long course of production of the P601, VEB Sachsenring developed prototypes for several potential new models including experimental Diesel and Wankel engine cars, but the communist authorities always denied them the huge funding required to tool up to produce other models. More than 3 million Trabants were built making it a very successful little car (to put that into perspective there were only just over 1 million Morris Minors made). Half a million of those were the estate ‘Universal’ or ‘Kombi’ model. An open top, jeep-like ‘Kübelwagen’ was produced for military and forestry use such as for patrolling the ‘inner’ East German border. In later years a civilian version of the Kübelwagen was produced called the Tramp. Around 12,000 Kübelwagen and Tramps were made. Other versions such as a van and a camping version (seats folding down to make a bed) were made in very small numbers. Waiting time for delivery of a new car could be as much as 15 years. Not surprisingly, owners took care of their cars and became skilful in maintaining them. The lifespan of an average Trabant was 28 years. A licencing arrangement between IFA and VW to produce 1.1 and 1.3 litre Polo/Golf engines was agreed during the 1980s before the fall of the Berlin Wall. 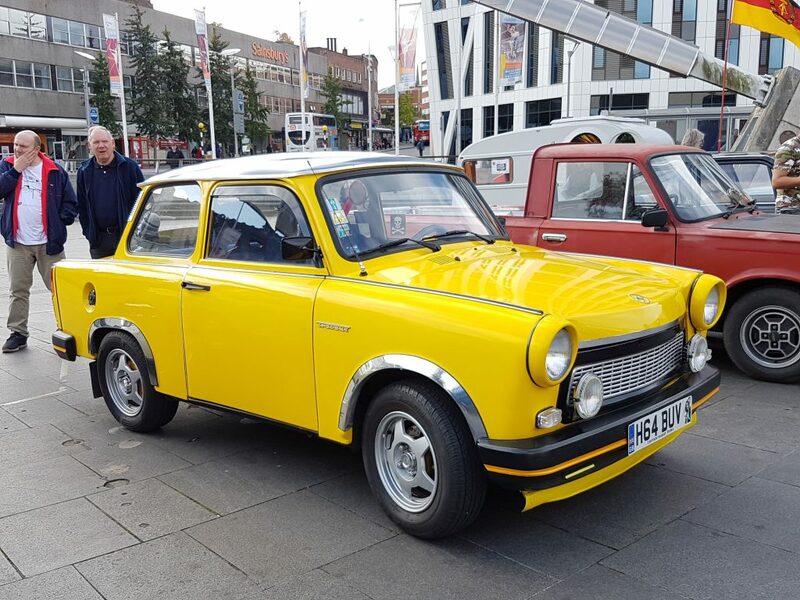 A new version of the Trabant was developed to take the 1.1 litre engine (the 1.3 litre engine was destined for use in Wartburg and Barkas vehicles). The new car still looked like the P601, but shared surprisingly few parts with the two-stroke cars. The first of the new 1.1 Trabants rolled off the production line at the end of 1988. Two stroke cars continued to be made alongside the 1.1 until July 1990. Production of Trabant 1.1 finally ended in April 1991 by which time around 50,000 had been made. 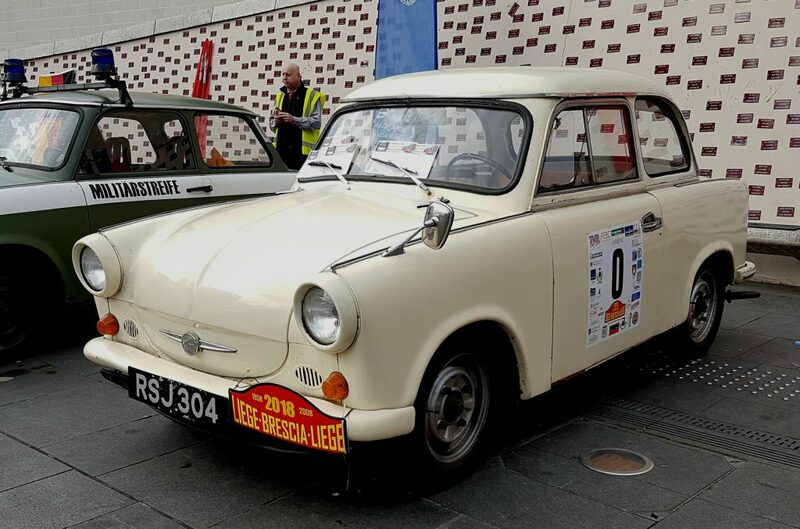 Trabants were exported from East Germany to quite a few countries, but only became well known in the UK after the fall of the Berlin Wall on 9 Nov 1989. Political freedom, and a generous ‘Ostmark’ to Deutschmark exchange rate, quickly allowed many East Germans to purchase second hand western cars to replace their Trabants. 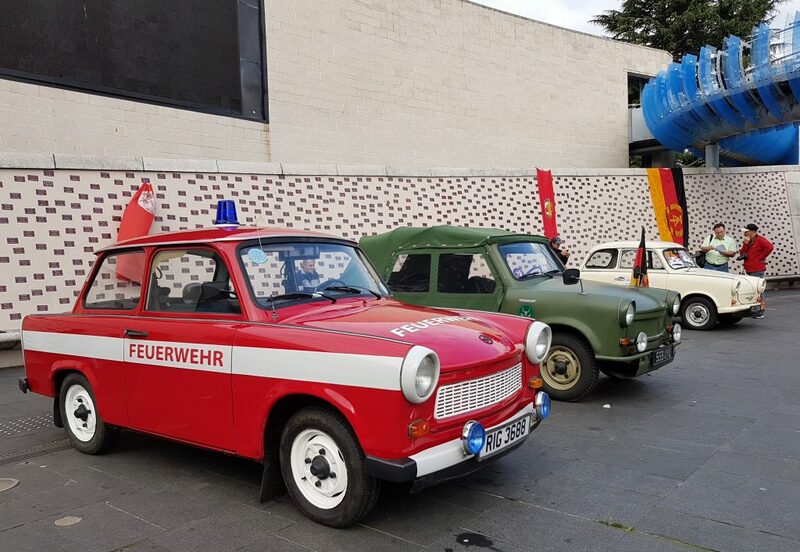 The car came to symbolise the DDR during the fall of the Berlin Wall in 1989, as images of East Germans crossing the border into West Germany were broadcast across the globe. 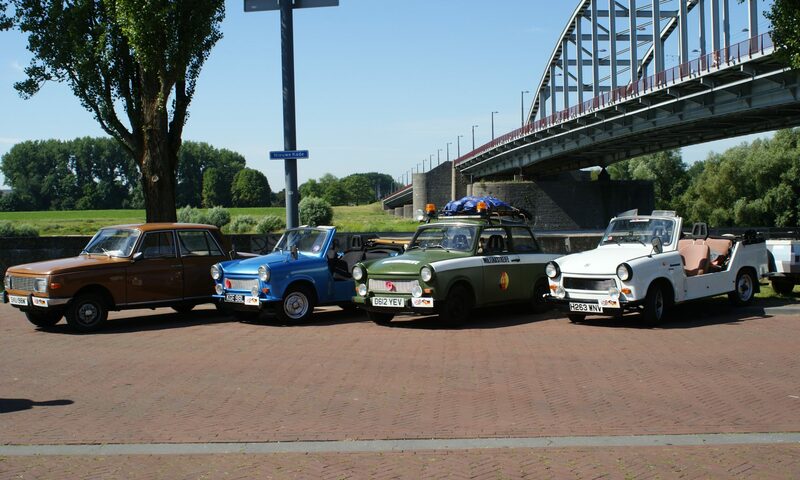 For a while the Trabi fell out of favour; many were simply abandoned by their East German owners when migrating westwards, others were scrapped when cheap second hand cars from West Germany became freely available. In the early ‘90s it was possible to buy a Trabi for a few Deutschmarks. Prices later recovered as the Trabi gained ‘cult’ status. 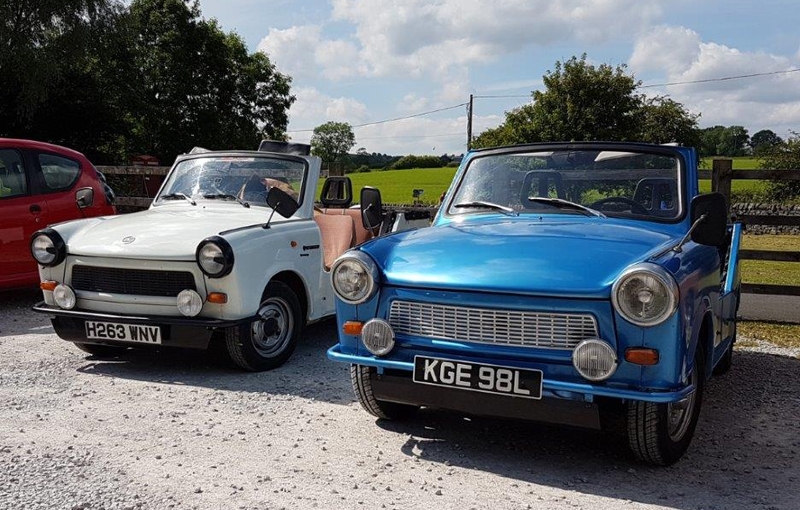 Today Trabants are starting to fetch prices commensurate with other classic cars. Engine: 2 cylinder, 594cc air cooled 2 stroke producing 23 to 26hp. Fuel: Unleaded petrol mixed with 2-stroke oil in a ratio of between 33:1 and 50:1 depending on the year made and the oil. Gravity feed from a 24 or 26 litre tank located above engine giving 40-50 mpg. Performance: 0–100kmph max (62mph) in 21 seconds (the factory always stated these figures, but the performance of the later cars became better as the car was developed). Brakes: Drum all round with twin leading shoe front brakes – non servo assisted. Gears: 4 forward and reverse, column change, free-wheel on 4th gear. Contrary to popular belief, the body is not made of cardboard. Duroplast panels are screwed to a steel monocoque chassis / frame. Following wartime destruction of German industry, the occupying Russians stripped and ‘de-industrialised’ East Germany for war reparations. Steel shortages led to the development in the early 1950s of immensely strong ‘Duroplast’ made from phenolic resins from the East German dye industry and cotton waste from Russia. The Duroplast panels were easily mass produced using heated presses in a process that was closer to the production of steel panels than to the relatively slow process of making fibreglass panels. Duroplast was initially tried on the bodywork of some IFA F8 cars, and was first used in volume production for the bodywork of the AWZ P70 which was made in the Zwickau factory before the Trabant.